MAY 5, 2014 -- During an oil spill, responders need to answer a number of questions in order to protect coastal resources: What happened? Where is the oil going? What will it hit? How will it cause harm? Not all of these questions can be answered adequately from the ground or even from a boat. Often, experts take to the skies to answer these questions. 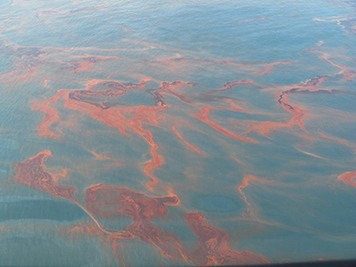 Aerial overflights are surveys from airplanes or helicopters which help responders find oil slicks as they move and break up across a potentially wide expanse of water. Our oceanographers make predictions about where a spill might go, but each spill presents a unique combination of weather conditions, ocean currents, and even oil chemistry that adds uncertainty due to natural variability. Overflights give snapshots of where the oil is located and how it is behaving at a specific date and time, which we use to compare to our oceanographic models. By visually confirming an oil slick's location, we can provide even more accurate forecasts of where the oil is expected to go, which is a key component of response operations. Trained aerial overflight experts serve as the "eyes" for the command post of spill responders. They report critical information like location, size, shape, color, and orientation of an oil slick. They can also make wildlife observations, monitor cleanup operations, and spot oceanographic features like convergence zones and eddies, which impact where oil might go. All of these details help inform decisions for appropriate cleanup strategies. Finding and identifying oil from the air is tricky. Oil slicks move, which can make them hard to pin down. In addition, they may be difficult to classify from visual observation because different oils vary in appearance, and oil slick appearance is affected by weather conditions and how long the oil has been out on the water. False positives add even another challenge. When viewed from the air, algal blooms, boat wakes, seagrass, and many other things can look like oil. Important clues, such as if heavy pollen or algal blooms are common in the area, help aerial observers make the determination between false positives and the real deal. If the determination cannot be made from air, however, it is worth investigating further. During an overflight, it takes concentration to capture the right information. Many things can distract the observer from the main mission of spotting oil, including taking notes in a notebook, technology, and other people. Even an item meant to help, such as a camera or GPS, can lose value if more time is spent fiddling with it rather than taking observations. The important thing is to look out the window! Safety is paramount on an overflight. An observer must always pay close attention to the pilot's instructions for getting on and off the aircraft, and not speak over the pilot if they are talking on the radio. While it's not a problem to ask, a pilot may not be able to do certain maneuvers an observer requests due to safety concerns. 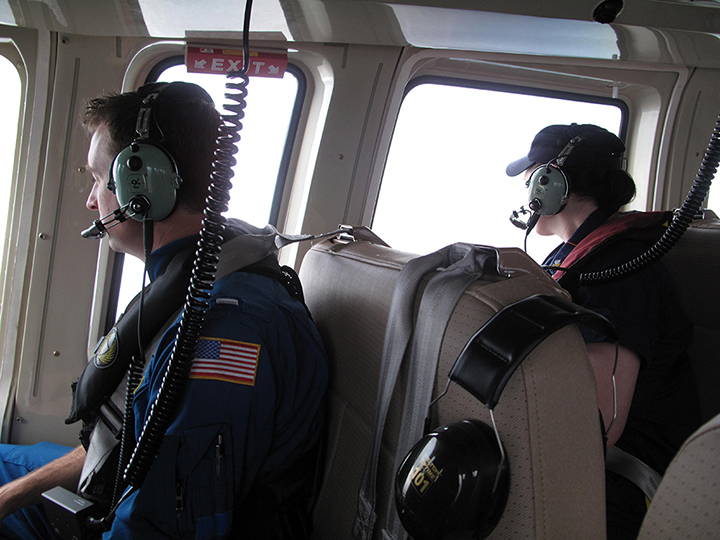 The Emergency Response Division of NOAA's Office of Response and Restoration (OR&R) has overflight specialists ready for quick deployment to do this job. 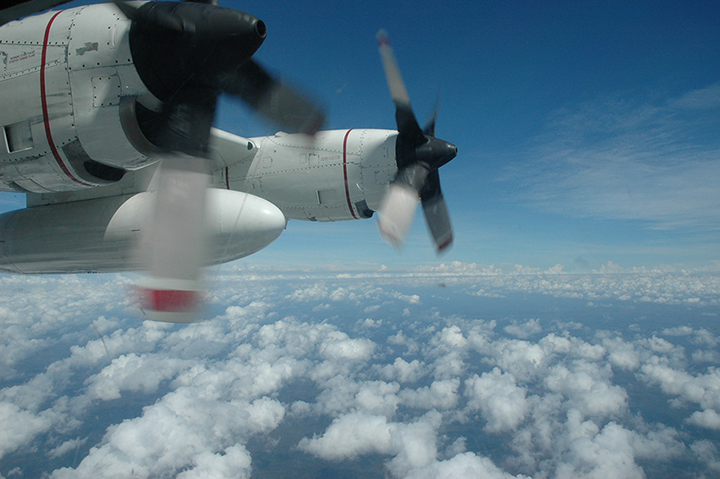 These specialists have extensive training and expertise in aerial overflights. When LTJG Alice Drury joined OR&R in 2011, she learned from the best before doing real-life observations herself. One of the first things she did was take a Helicopter Emergency Egress course to make sure she could safely exit an aircraft that had made an emergency landing over water. Then she took the Science of Oil Spills course, where she learned more about observing oil from the air. In preparation for her first overflight she also had one-on-one conversations with our trained aerial observers. Since then, LTJG Drury has done aerial observations for oil spills including a sunken vessel in Washington's Penn Cove, the Post-Tropical Cyclone Sandy pollution response, and the Texas City "Y" oil spill in Galveston Bay. OR&R provides training opportunities for others who may need to do an overflight during a response. Throughout the year, OR&R offers Science of Oil Spill classes across the country. 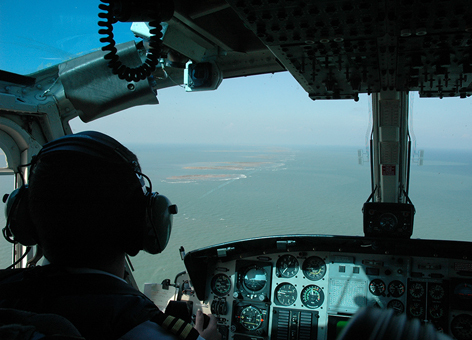 In March 2014, more than 50 oil spill responders learned about aerial observing, and many other spill response skills, at OR&R’s Science of Oil Spills class at NOAA's Disaster Response Center in the Gulf of Mexico. For those interested in becoming an overflight specialist themselves, OR&R even offers a one-day, in-person course on the topic throughout the country a few times per year. OR&R has also created the online module, "Introduction to Observing oil from Helicopters and Planes," to make training even more accessible. We even have a job aid for aerial observation of oil, a reference booklet conveniently sized to take on an overflight!